This decadent appetizer was inspired by the signature appetizer of Martín Berasategui, three Michelin star chef from San Sebastian (Spain), “Mille-feuille of smoked eel, foie-gras, spring onions and green apple”. The combination of foie gras with smoked eel and green apple is as amazing in this simplified rendition as it was at the restaurant. The combination of the salty smoky unctuous eel with the velvety foie gras, the crispy sweet/tart apple and the crispy sugar is just wonderful. 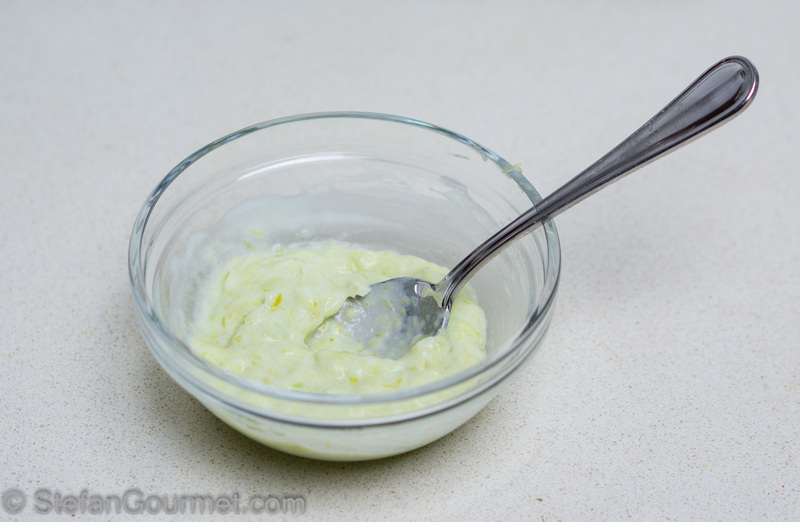 The puree of spring onions adds yet another layer that works very well. As decadent as this is, only 8 ingredients are required. Most of the work is in the presentation, and the hardest part by far is the crispy thin layer of sugar on top. 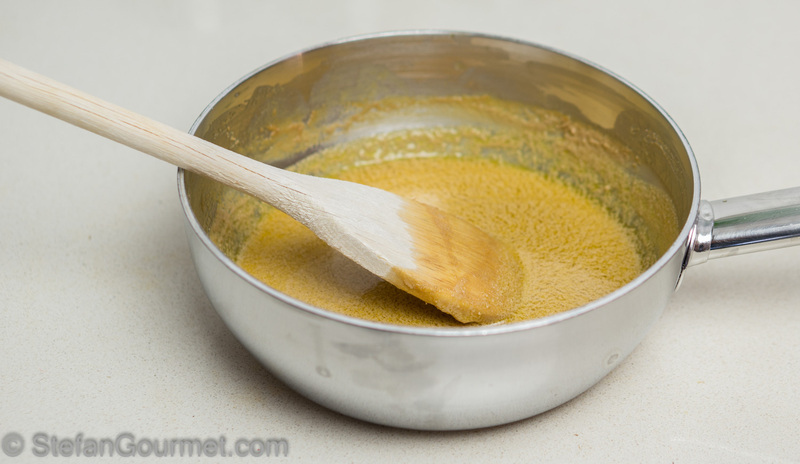 Melted sugar is difficult to work with, as it may harden before you’ve had the chance to spread it out thinly enough. I tried to use acetate foil to make it easier to remove the ring mold without ruining the presentation, with limited success. 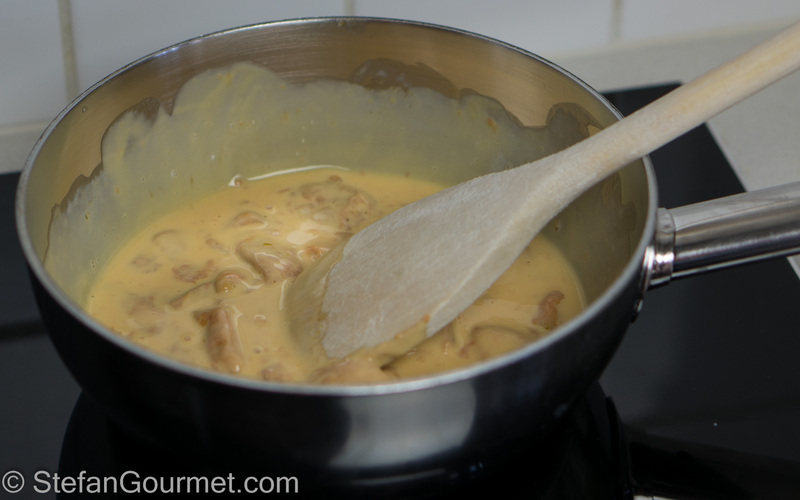 Put the foie gras, cut into pieces, in a saucepan with 60 ml (1/4 cup) heavy cream over low heat. 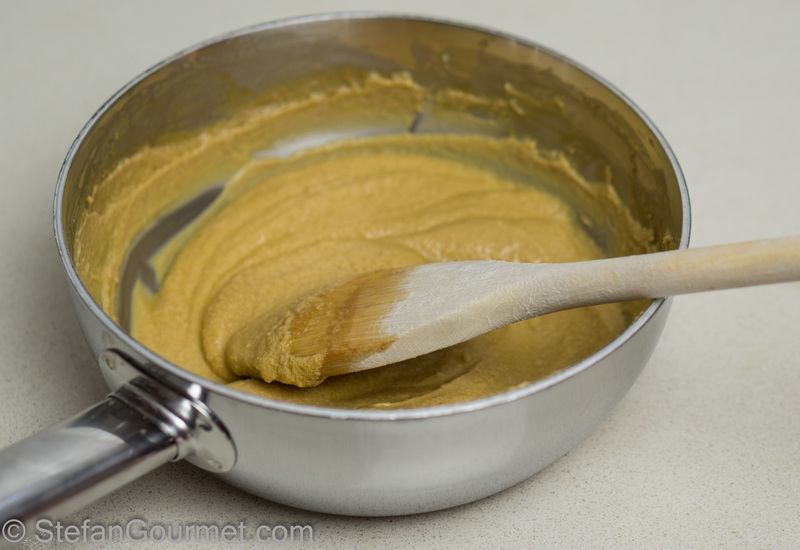 Stir until the foie gras starts to melt. Make sure the cream won’t boil! 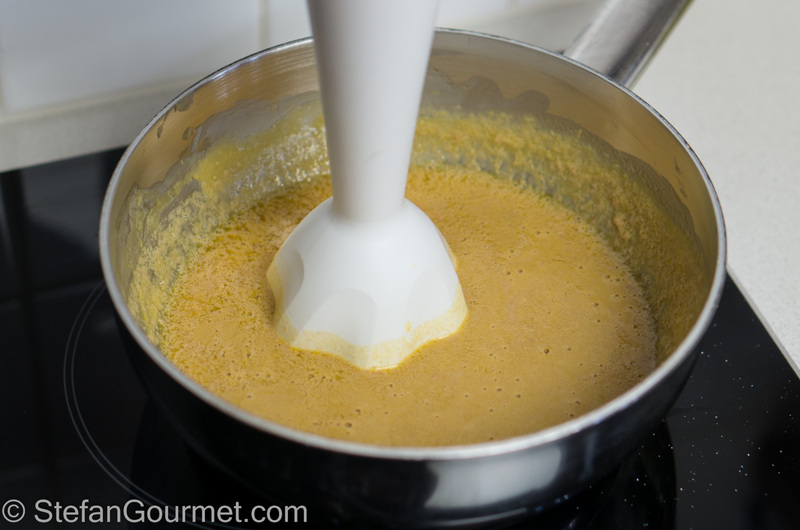 When the foie gras is soft, turn off the heat, season with salt, and blend with an immersion blender. 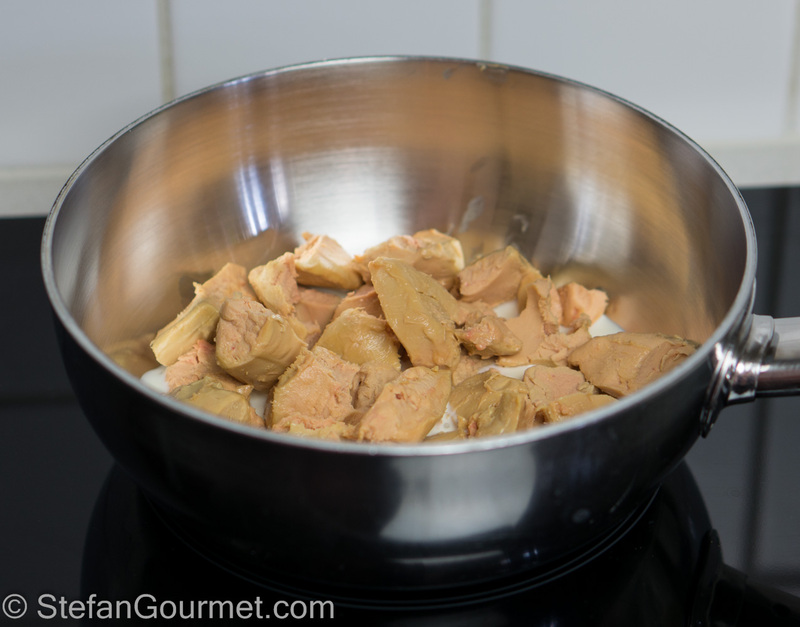 Allow the cream of foie gras to cool to room temperature, stirring now and then to prevent it from separating. Once it is cool, taste and adjust the seasoning with salt. A nice bit of salt really brings out the flavor of the foie gras. 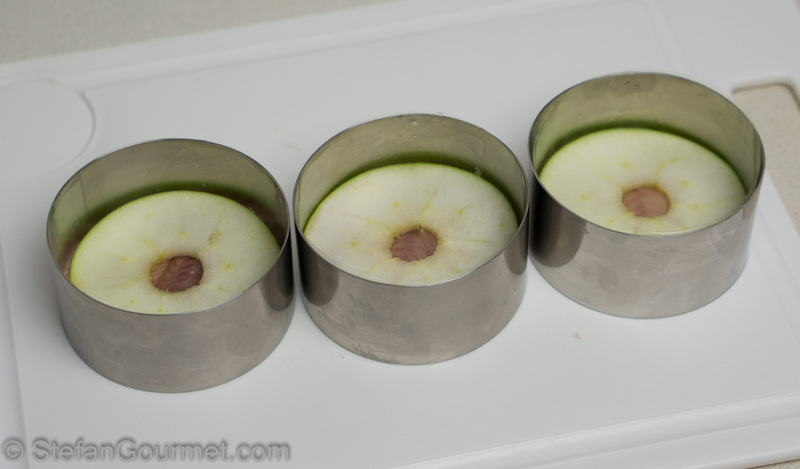 Select ring molds into which the apples fit snugly. 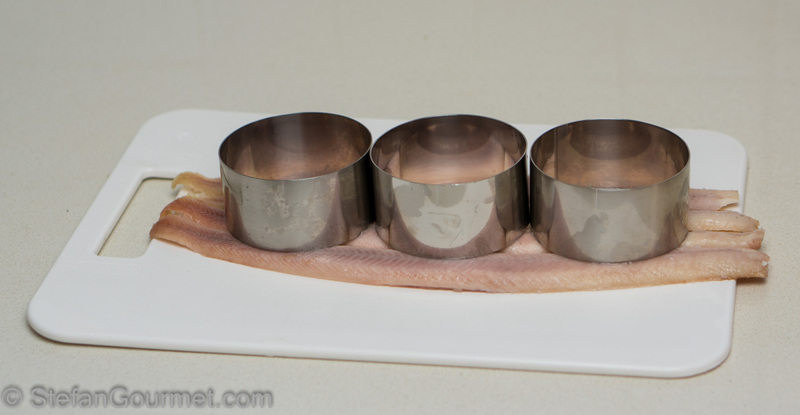 Use the ring molds to cut out circles of smoked eel. 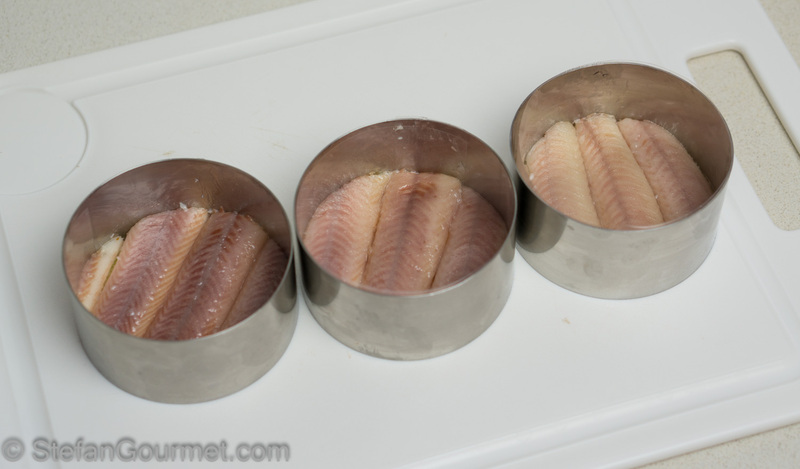 There will be some leftover eel, a nice reward for the hard work of the chef! 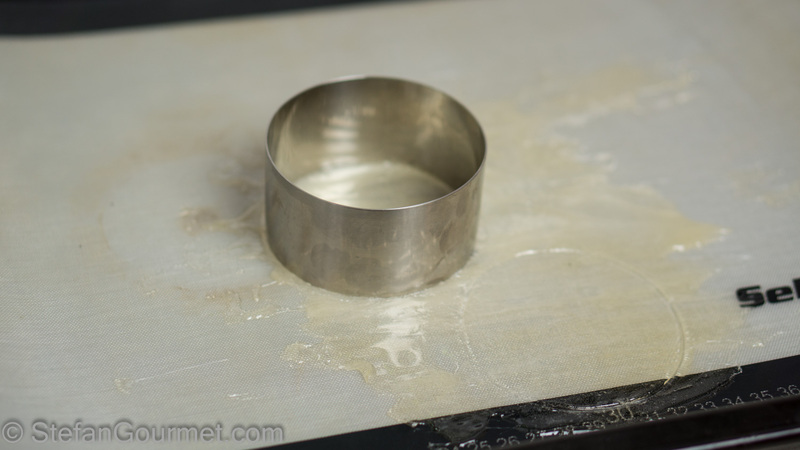 I lined the ring molds with acetate foil to make it easier to remove the molds later, but it didn’t help as much as I had hoped. Wash and dry the apples. 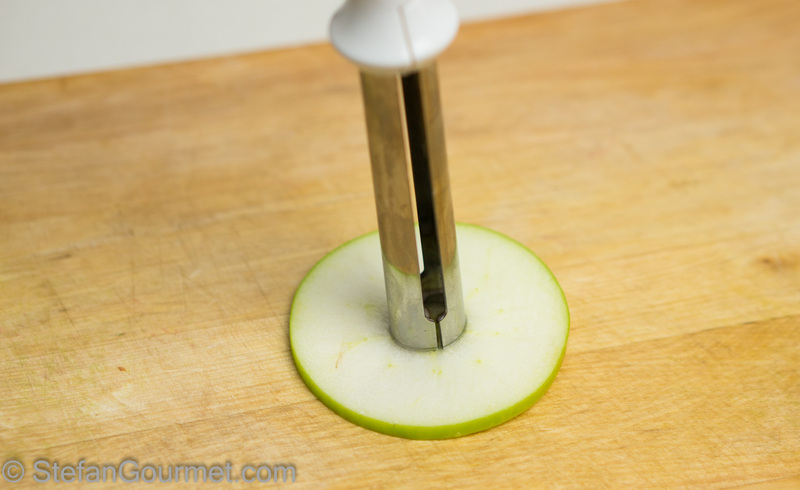 Cut 8 thin slices out of the thickest part of the apples. 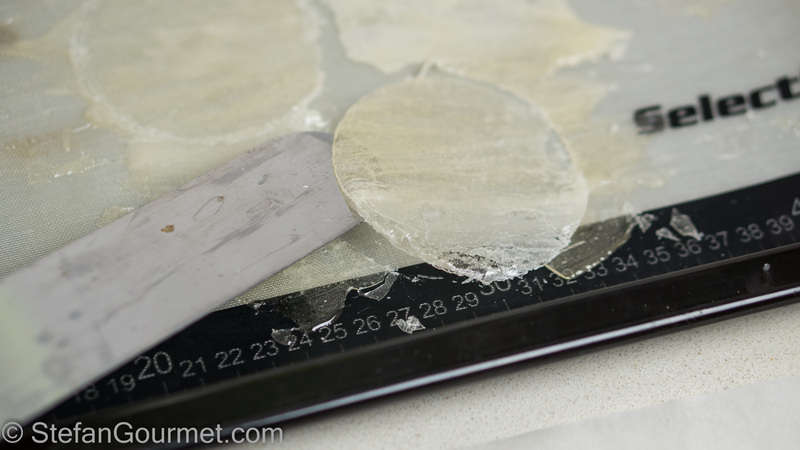 Make the slices as even and as thin as you can, about 1 mm (1/24 inch). Remove the core. 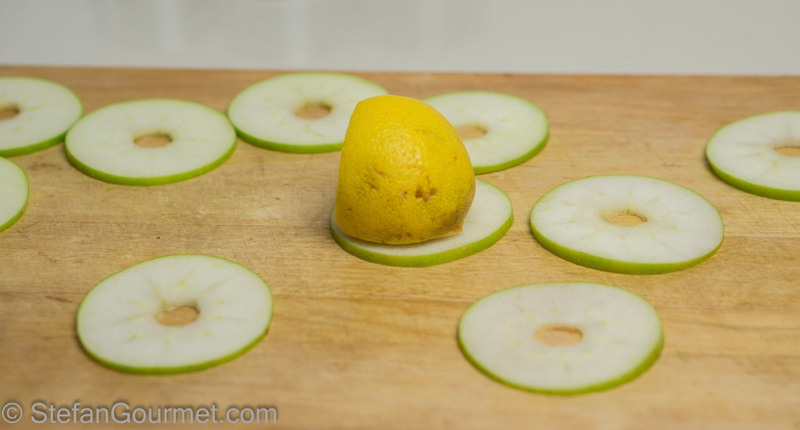 Rub the apple slices with a halved lemon to prevent them from discoloring. You are now ready to assemble. Arrange the ring molds on a cutting board. 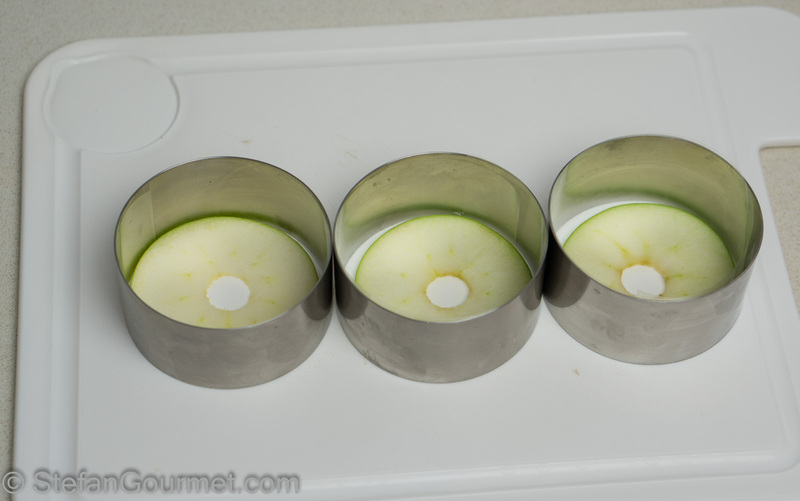 Put a slice of apple in each mold. Arrange a circle of smoked eel on top of each apple slice. Cover each with another slice of apple. Divide the cream of foie gras on top, flattening the top. Cover with plastic wrap and refrigerate to firm up. Meanwhile, preheat a baking sheet with a silicone mate at 150ºC/300ºF in the oven. 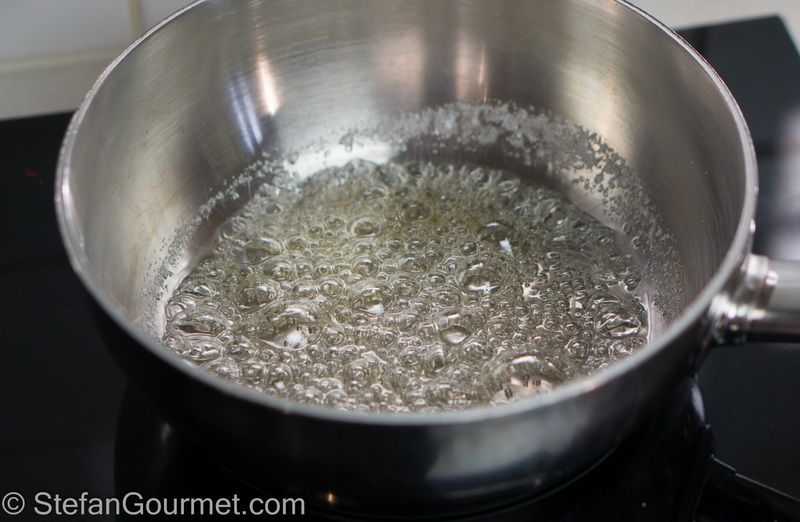 Melt the sugar in a saucepan with just enough water to let is dissolve (as little as possible) over high heat until the sugar barely begins to turn amber. Pour the melted sugar on the preheated silicone mat. Spread out the melted sugar as thinly as you can. 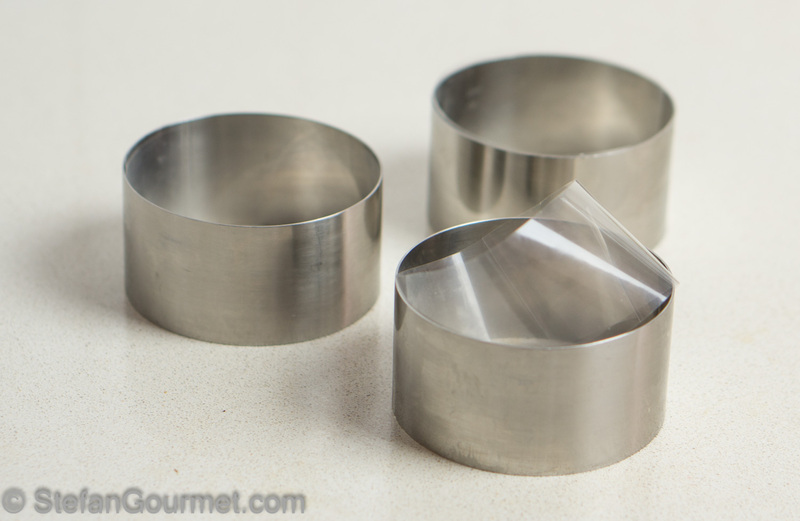 Allow the sugar to harden for a bit, then use a ring mold to cut out circles. 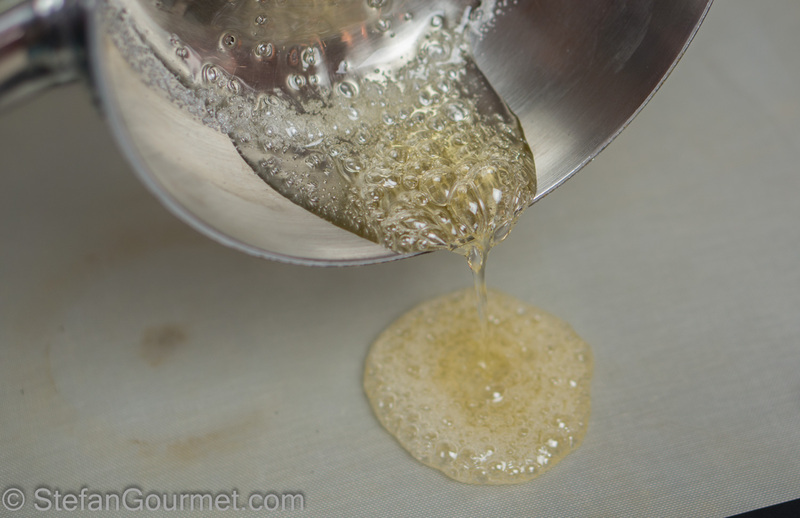 Allow the sugar to harden fully before carefully extracting the circles of crispy sugar. 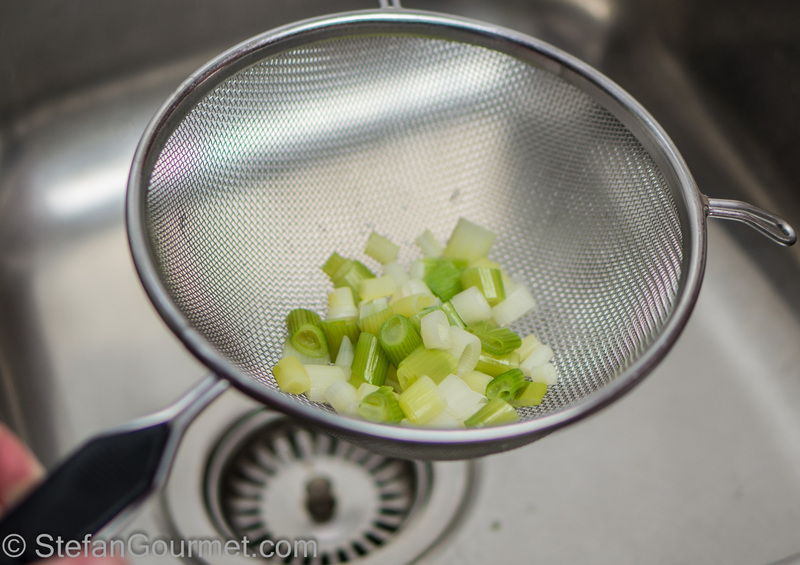 While the sugar hardens, make the cream of spring onions. Remove the roots and the darker green, keeping only the white and light green. 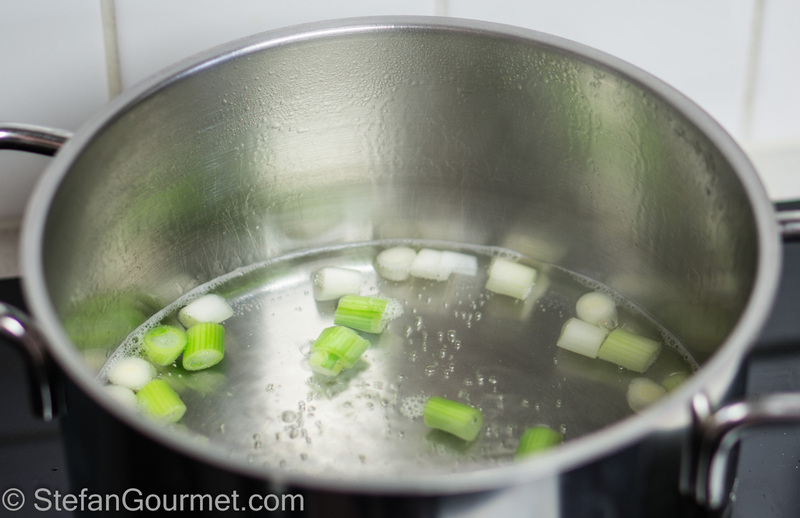 Chop the spring onions and boil them in water for 15 minutes. 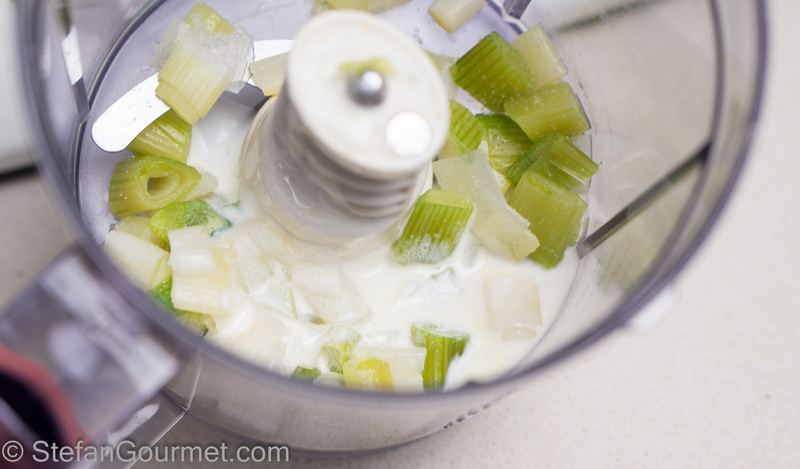 Puree the spring onions with 1 Tbsp of cream and some salt in the blender. 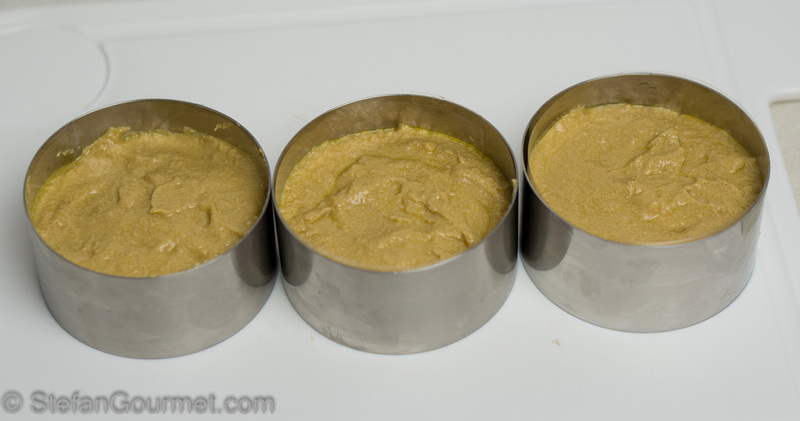 Once the cream of foie gras has firmed up, transfer the ring molds to serving plates. 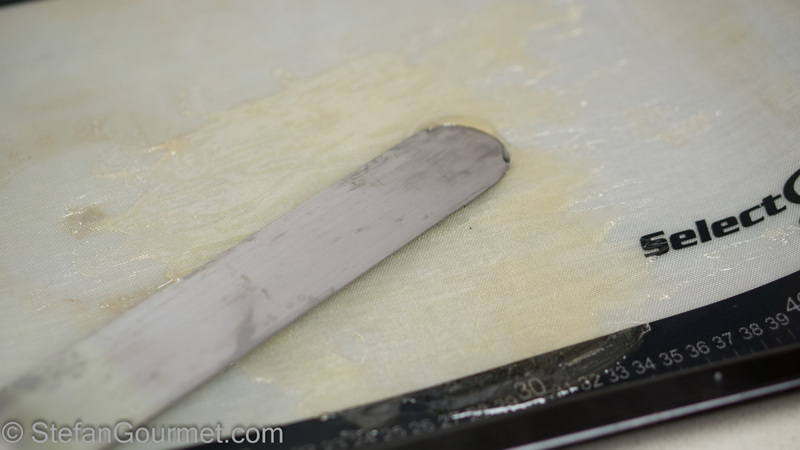 Carefully remove the ring molds, using a knife to cut along the inside to loosen the foie gras from the mold. 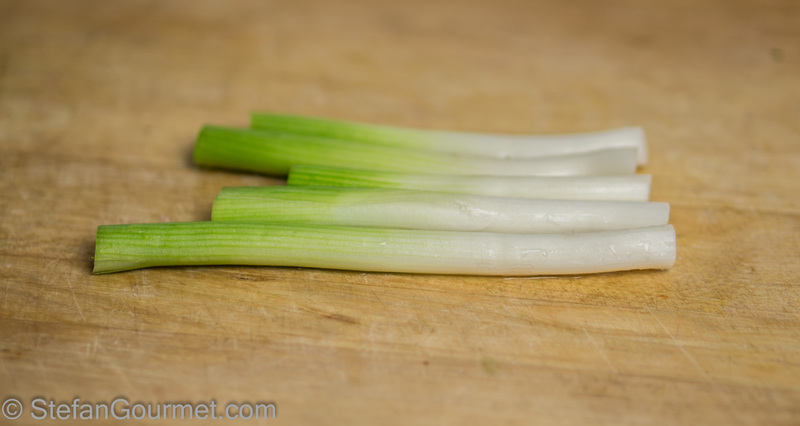 Place the circles of crispy sugar on top, and serve with some dollops of the cream of spring onions on the side. The cream of foie gras is best when it is served warmer than refrigerator temperatures, but cooler than room temperature. We enjoyed this with a mature Mosel Riesling Auslese, but a Spätlese (slightly less sweet) would have been even better. The sweetness works well with the foie gras and the sweetness of the apple and sugar. The freshness of the riesling works well with the apple. 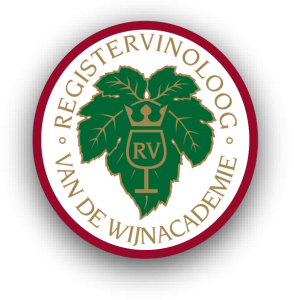 The minerality works well with the smoked eel. The creaminess of a mature Riesling works well with the eel and foie. 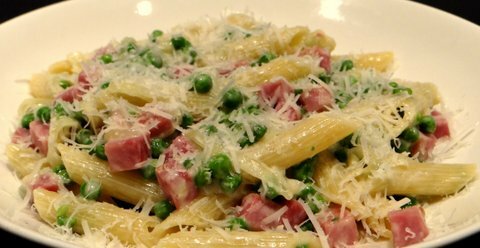 Penne with peas, ham and cream is a simple but tasty pasta dish is great for a weekday meal, especially since all the ingredients can be purchased quite a long time in advance. complimenti, è un piatto da gran chef. Sei veramente bravissimo. Thank you for this great recipe, it must be a real treat. Just one question, do you raw foie gras or mi-cuit? Thanks, Leif. 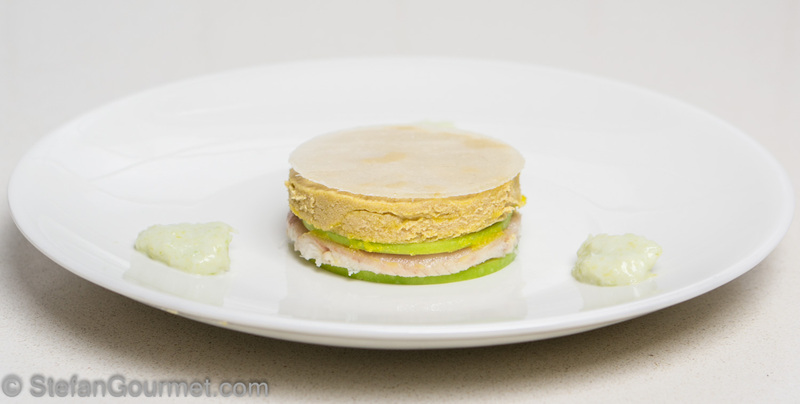 I start with raw foie gras, that is why I cook it with the cream. If you were to use foie gras that is already cooked, you could simply cut it to size. Off course, thank you for your quick reply. This recipe is incredibly technical. I am so impressed by your skill. Well done, Stefan. Honestly, I would never thing to combine a smoke fish, foie gras and apple. But, the way you describe it convinces me. Smoky, salty, sweet, bitter combine to create a beautiful flavor profile. I enjoy reading your written words and much as I do gazing at your foodie fotos. 🙂 By the way, I’ve heard about Martín Berasategui and love Spanish cuisine!